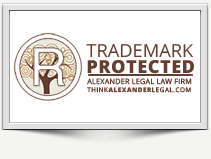 At Alexander Legal, our trademark services are based on legal experience and expertise that you will not receive from non-law firm businesses such as Legal Zoom, Trademark Plus, and the like. Our flat-fee trademark cost covers more than just preparing and filing your trademark application. Filing a trademark application is only one step in the process to successful registration of your trademark. We follow your application through the prosecution phase and work with the trademark examining attorney at the United States Patent and Trademark Office (USPTO) assigned to your review and approve your application. Our goal is the successful registration of your trademark, not just the filing of an application. Our team provides high-quality, professional and personal legal service that you will not receive from a $99 + filing fee bulk registration service. Take the first step toward securing and protecting your trademark by contacting us today for your FREE initial consultation. It ensures that potential customers/clients know your business as the provider of exceptional goods and/or services. Helping you enforce your trademark rights. Although performing a trademark name search is an optional step, if it fits in your budget, we strongly advise that you retain us to order a trademark clearance report and analyze the results for you. A trademark clearance search helps determine the likelihood that your mark will be registered by determining if your trademark is unique or whether someone else has already started using a similar mark for similar goods and services. If the cost of a trademark clearance report (approximately $800) is not within your budget, we can assist you with our own “advanced knockout” search ($350) to better assess the risks that your application might face while making its way through the USPTO. Our Atlanta trademark attorneys work closely with you to identify the marks in your portfolio for which you may wish to seek for trademark registration. Our trademark lawyers identify for you the class(es) in which you can choose to seek trademark registration for your goods and/or services, so that you may determine which classes are most important to your business. If you have identified your trademark, but you are not yet using it in interstate commerce, our trademark attorneys will prepare and file an intent-to-use application and advise you of the follow-through procedures necessary to ultimately register your trademark. If we have prepared and filed your trademark application, we will handle purely procedural USPTO Office Actions at no cost to you. Examples of purely procedural Office Actions include: amending description of goods/services; submitting additional specimens; disclaimers. If your trademark application has received a substantive initial refusal, we will handle these Office Actions at our standard hourly rate of $225/hr. If you are a current client, discounts may be available. During the prosecution of a trademark application, a third party may file an Opposition to the registration of your mark. An opposition is a legal proceeding held before the Trademark Trial and Appeal Board (TTAB), a United States Patent and Trademark Office (USPTO) administrative tribunal. Any third-party with standing may oppose the registration of a trademark. We handle opposition proceedings for both plaintiffs (those seeking to oppose registration of the mark in question) and defendants (the owners of the trademark application being opposed) at our standard hourly rate of $225. Discounts may be available for current clients. After a mark is registered, a party that believes it is being damaged by a registration may seek to remove the existing registration from the trademark register by filing a petition to cancel. We handle cancellation proceedings for both plaintiffs (those seeking to cancel the registration) and defendants (the owners of the trademark registration subject to cancellation) at our standard hourly rate of $225. Discounts may be available for current clients. If you have identified an individual or business that you believe is infringing on your trademark rights, we can prepare and send a Cease and Desist letter on your behalf. Although you can send your own Cease and Desist letter, experience has shown us that a letter from an attorney is taken more seriously. If you have received a Cease and Desist letter, we can prepare and send a response on your behalf.